The Multi-Purpose Logistics Module Raffaello is seen berthed to the Unity module of the International Space Station on July 29, 2005. HOUSTON - The International Space Station(ISS) received a special delivery Friday after astronauts successfullyinstalled a fresh cargo module ferried into orbit by the space shuttleDiscovery. Discovery pilot James Kelly andmission specialist Wendy Lawrence eased the Italian-built cargo carrier Raffaello, a sort of portable pantry filled with twotons of supplies, to a port on the nadir side of the station's Unity module at4:05 a.m. EDT (0805 GMT). "Thanks for the great work," Kellysaid to flight controllers. 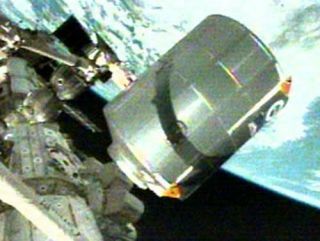 Kelly and Lawrence used the spacestation's Canadarm2 to grapple Raffaello at about1:57 a.m. EDT (0557 GMT) today, and plucked it from Discovery's payload bayjust over an hour later. A minor computer glitch, prompting Kelly to reboot therobotics station aboard the ISS and swap out a laptop computer, briefly delayedthe operation. Aside from the computer glitch, Raffaello's berthing at the Unity module went smoothly. Discovery mission specialists Soichi Noguchi and Stephen Robinson - wearing hardhats inhonor of the space construction work - assisted in the operation. One of four Multi-Purpose LogisticsModules (MPLM) built by the Italian Space Agency, Raffaellocontains 12 racks full of new research hardware, food, clothing and othersupplies needed by the space station crew. Among the cargo's highlights is theHuman Research Facility rack 2 (HRF-2) to bolster biomedical research aboardthe space station. The two tons of cargo inside Raffaello are just a fraction of the total 15 tons ofsupplies Discovery is hauling to the ISS. The space shuttle is the soletransport capable of delivering large payloads to the ISS, though RussianProgress and Soyuz spacecraft delivered new crews and supply ships to thestation about every six months. The Russian launches were key to the space station's continued manned operationsfollowing the 2003 Columbia disaster that grounded NASA's shuttle fleet untilDiscovery's flight. Discovery launchedspaceward on July 26 with veteran astronaut Eileen Collins in command. Foamloss from the orbiter's external tank, the same type of problem that doomedColumbia and its crew, prompted NASA to suspend subsequent launches until theissue is rectified. In response, Collins and her crewmay try to leave the station with additional supplies, such as extra waterproduced by Discovery's fuel cells, though those discussions are still ongoing,NASA officials said. Lawrence is serving as theloadmaster for STS-114 spaceflight, and will oversee the cargo transfer intothe ISS as well as the transport of unnecessary materials back into Raffaello for a return trip to Earth. Space shuttle and ISS astronauts areexpected to activate the Raffaello module at about8:45 a.m. EDT (1245 GMT) today. The first astronauts should enter the cargo podat about than 10:49 a.m. EDT (1449 GMT). Later today, Discovery's crew willtake time to speak with radio reporters and perform additional inspections oftheir spacecraft using the shuttle's orbital inspection boom. NASA hasidentified 11 areas - two of which will be deferred until Saturday - forfollow-up inspections based on imagery taken ISS astronauts and a previous boominspection conducted by Discovery mission specialists Andrew Thomas andCharles Camarda, and Kelly.